Bike HUD is a new development in motorcycling instrumentation that promises to improve safety and enhance riding experiences. Just ve months before launch at the UK’s most important bike show, the Bike HUD design team asked EC Electronics to help solve the last remaining design challenges, optimise the design for manufacture, and begin building production units. Bike HUD is a remarkably simple concept that puts important instrumentation directly in the rider’s eld of vision without obscuring the view ahead. This helps overcome some of the unique challenges associated with riding a motorcycle, such as remembering to cancel indictors, knowing which gear is selected, and checking speed while maintaining observation of the road. The system features a monocle display that clips onto the rider’s helmet and displays current speed and indicator status on a miniature OLED screen, using colour coding to highlight urgent issues such as excessive speed. Other information can include gear selected, time of day, engine speed and fuel level ( figure 1). The rider can customise the display using a handlebar-mounted controller, and choose from four modes suited to commuting, leisure riding, touring or track days. The system’s central computer, known as Bike HUB, is mounted in a convenient position on the chassis ( figure 2), and connects into the bike’s original wiring. The three units are linked by cables, saving the complexity of wireless communication and allowing the monocle to operate without a battery. Dave Vout, Managing Director of Bike Systems, the company behind Bike HUD, had to deal with significant practical constraints to realise the system as an aftermarket product ready to t to riders’ bikes. The units had to be small and lightweight, not only to avoid interfering with the appearance or dynamics of the bike but also to maximise market appeal by allowing a versatile fitting compatible with the broadest possible range of bikes. In addition, each unit had to be tough enough to withstand the rigours of everyday use, including environmental hazards such as rainwater, condensation, dirt and dust, shock, and vibration. Moreover, the system had to be offered at an affordable resale price. To achieve a price he believed the market would accept, Dave Vout set an aggressive target of less than £300 per system. To deliver Bike HUD within the constraints prevailing, Dave Vout first contacted Birmingham-based embedded-systems house Bytesnap Design. He briefed founders Dunstan Power and Graeme Wintle on his idea, and together they began to assemble the development team comprising software engineers, the engineering team at Bluefrog Design in Leicester, and EC Electronics. EC Electronics was engaged to perfect the design for manufacture and take full responsibility for production, from component sourcing to building the finished units including custom cables. 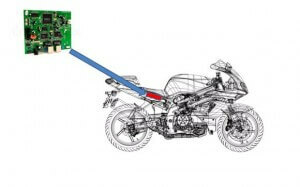 The DFM skills of EC Electronics, covering areas such as board layout and component engineering, contributed to reducing the prototype Bike-HUB PCB dimensions to t within a 102mm x 88mm x 16mm enclosure weighing just 220g, thereby allowing easier aftermarket installation on a wide variety of bikes. DFM also helped minimise Bill-Of-Materials (BOM) costs, streamline assembly processes for optimum productivity and efficiency, and avoid problems such as component shortages that can halt production. Also, by working with contacts at EC’s Hong Kong subsidiary EC Supply Chain Solutions, the company’s engineers were able to source an important custom component at a more competitive price. 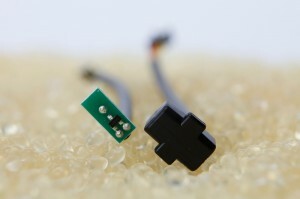 In addition, by taking advantage of well-developed in-house processes for low-pressure overmoulding, EC’s engineers were able to o er a rugged nal packaging for the modules that would provide a high level of protection for the electronics against hazards such as ingress of water or dirt. “As we discussed the possible packaging options, it became clear that low-pressure overmoulding is well suited to the cost, performance and volume requirements of Bike HUD,” comments Bytesnap’s Dunstan Power. Low-pressure overmoulding is a cost-effective encapsulation process that was first deployed commercially in the automotive industry, to produce rugged, lightweight assemblies on a fast-turnaround basis. It is suitable for a wide range of applications, such as plugs, connector housings, cable assemblies and sensors, and allows features such as grommets to be integrated with the assembly in the exact position required. The typical turnaround time is about two months, from design to completion, much faster than competitive injection moulding methods. Tooling, usually a two-part custom aluminium assembly, can also be produced at lower cost than tooling for injection moulding. 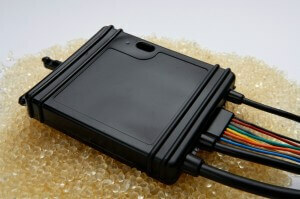 The PCB to be overmoulded is placed in the tooling and encapsulated using a liquid polyamide thermoplastic. When the thermoplastic cools, the finished assembly is removed from the tooling. “Having this process available in-house allows us to manufacture low production volumes at competitive prices and to a very high standard of finish,” comments Bill Green, low pressure overmoulding specialist at EC Electronics. For Bike HUD, EC Electronics produced three sets of tooling, for the monocle, the handlebar controller, and the Bike HUB central computer. The EC engineering team developed a two-stage overmoulding process for the Bike HUB, to design out the possibility for air inclusion in the complex encapsulation and so ensure the best possible production yield. Taking advantage of EC Electronics’ complete end-to-end service encompassing DFM, prototype project support, component sourcing assembly of pre-production samples, and production and test of market-ready units, the project team was able to complete Bike-HUD in time for launch to an intrigued press and public at the November 2013 Motorcycle Live bike show in Birmingham’s NEC.